Despite the fact it was a nondescript Tuesday night in April, there was a palpable energy in the packed Boulder Theater. It had been a while since the venue had seen Gogol’s innovative blend of gypsy/world/punk music, and the anticipation had built to a fever pitch. The crowd erupted when the band finally hit the stage a little after 10 pm with “We Rise Again,” the first song from their latest album, Pura Vida Conspiracy. “Not a Crime” and “Wanderlust King,” two immensely popular songs in the band’s catalog, immediately followed and the tone for the evening had been set. They dug back into the new album for the excellent “The Other Side of Rainbow,” which sees Hutz reflecting on the not-so-pretty side of life, where everything is “black and white.” Gogol’s reputation as a party band doesn’t mean they aren’t capable of producing complex, thought-provoking lyrics. This song, with Hutz musing about “finding freedom” in the “deeper knowing” of one’s soul, is a superb example of the strength of their songwriting. 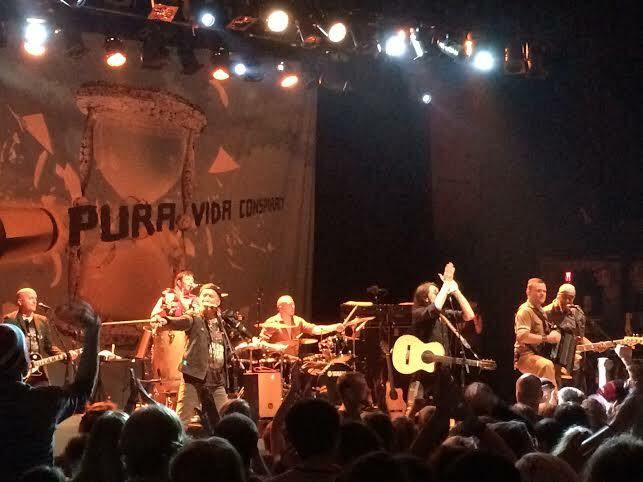 After a few songs from Trans-Continental Hustle, including “Mi Companjera” and the softer (meaning it gives the crowd a chance to catch their breath) yet triumphant “Last One Goes to the Hope,” the band reached way back for “Bara Foro,” from their second album Multi Kontra Culti vs. Irony. The song is sang entirely in Ukranian, but that doesn’t mean it didn’t achieve its desired impact. In fact, if anything, it gave the other amazing band members a chance to shine, especially violinist Sergey Ryabetsez, whose vigorous playing conveyed just as much emotion as any lyrics could ever hope to do. Make no mistakes; Hutz is an excellent frontman, and he is the one most closely identified with the band. 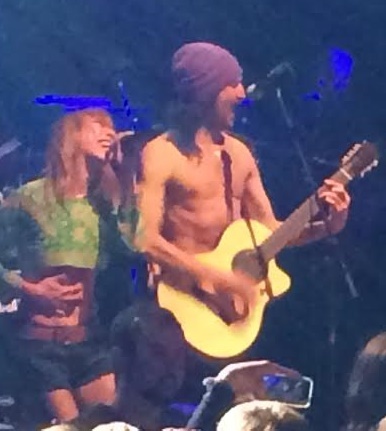 But what I have always enjoyed about Gogol Bordello is the dynamic between all eight members. The diversity of the members (the eight hail from seven different countries) and the energetic movement between all of them makes for an incredible stage presence. Sometimes they don’t even have to be playing anything. Even though MC Pedro Erazo and dancer Elizabeth Sun don’t play many instruments on stage, I can’t imagine a Gogol show without their charisma and relentless crowd-hyping. The set ended with a couple of Gogol classics, “Start Wearing Purple” and “Sally.” “Purple” is basically the anthem for the band, a certain crowd-pleaser and a near-guarantee to hear anytime the band is playing. “Sally,” on the other hand, isn’t quite as frequent, and it also happens to be one of my personal favorites. Suffice to say, my excitement at hearing the song was such that it didn’t even matter Hutz completely skipped an entire verse. They had to save something for the encore, right? Indeed they did. The three-song encore featured an incredible rendition of “Alcohol,” Hutz’s ode to well, you know. The song began with just Hutz strumming his acoustic guitar, but he was gradually joined by Ryabetsez and accordionist Pasha Newmer.